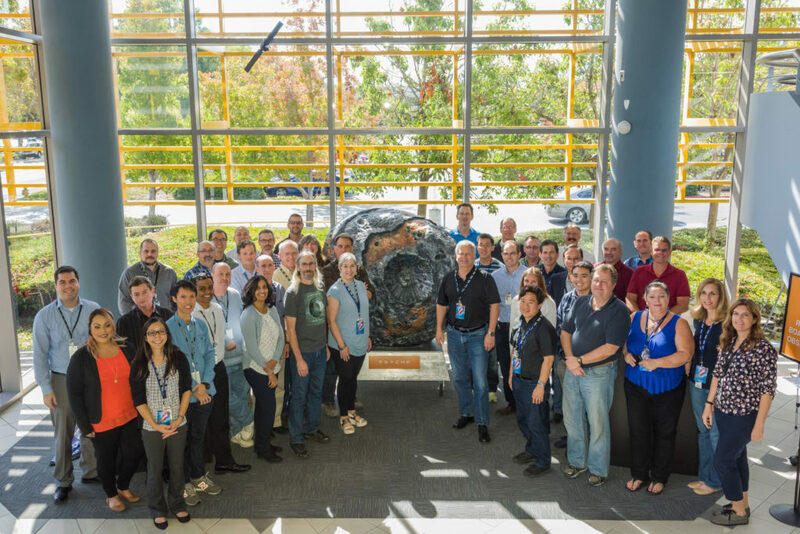 What does a Chief Engineer do on NASA’s Psyche Mission… and how did I get this gig? Dan Goebel here again. Things must be going very well on the Psyche Mission to a Metal World because I found a little time to write another blog. I want to pause here a minute in my writing about electric propulsion because several people have asked me what a Chief Engineer does. Here’s what I think they do (I hope the Psyche management team agrees), and also how I got to be one. My official title on the Psyche Project is Spacecraft Chief Engineer. There was a lot of discussion amongst the Psyche leadership team about who to put into this position before I got the job. I didn’t really understand why because when I was working in industry about 15 years ago I already had the title of Chief Engineer at a division of Hughes Aircraft. My daughter was a girl scout at the time, and one weekend I was helping repair cabins at a girl scout camp in the mountains near LA. Towards the end of the day a little girl-scout about 8 years old came by and me asked what I was doing. I said carpentry, and she asked if that was my real job. I said no, I worked on satellites and she asked what my title was. I replied: “Chief Engineer”. She just about fell over laughing, and finally managed to say: “Do you wear feathers to work? That’s the dumbest thing I’ve ever heard!” and ran away. So in my experience, the Chief Engineer title was no big deal. I’ve since found out that being a Chief Engineer on a JPL flight program is a big deal, and despite the qualifier “spacecraft” at the beginning of my title I’m the only Chief Engineer on this mission. The position of Chief Engineer on a JPL flight program is highly sought after. The reason people want to be a Chief Engineer, as near as I can tell, is that it’s a position of considerable authority with little or no direct responsibility. That’s probably wishful thinking on my part, but it sounds great, doesn’t it? The Chief Engineer position can also be a bit contentious. Highly experienced and assertive people are usually placed in this position because their real job is to make sure that everything on the spacecraft works right. Chief Engineers may be provocative and meddle in other engineers’ areas to resolve issues and get things done, which sometimes doesn’t make a lot of friends. Large missions like Cassini and MSL can have several Chief Engineers working in different areas, which can also lead to confusion in the organizational chart. So far, so good with only one of us on Psyche. My path to Spacecraft Chief Engineer is a bit unusual because the position usually goes to very senior engineers with extensive experience on flight projects. I’m actually a Senior Research Scientist at JPL and have spent the majority of the past 15 years doing research and development in electric propulsion. About 10 years ago I was asked to teach the senior-level Spacecraft Design course at UCLA. They asked primarily because I spent 7 years in academia and then 15 years in the aerospace industry working in different fields, and so I was very familiar with many of the parts inside of a spacecraft called subsystems. There are seven subsystems on a spacecraft; propulsion, power, telecommunications, thermal, attitude determination and control, structures and Command and Data Handling (C&DH), and I’m pretty knowledgeable about at least four of them. UCLA figured that if I knew a lot about the innards I could teach designing the overall spacecraft. That turned out to be pretty true, but I also have a lot of guest lecturers come in from JPL who are true experts in these subsystems and bring lots of experience and background information to the class. Several years after starting to teach this class, JPL turned around and said that if I could teach spacecraft design at a major university, I could lead the spacecraft design on some of their scientific mission proposals to NASA. There’s a chicken-and-egg problem in there somewhere, but whatever. So I started supporting and eventually leading spacecraft design on some of the JPL mission proposals. A real departure from research and development. The Psyche mission proposal effort actually started over four years ago without me. After several months of outstanding work, the Lead System Engineer, who is the person responsible for bringing together the spacecraft design, left for personal reasons. The JPL Project Office called me in (it felt like going to the principal’s office) and explained that what they wanted me to do was write the proposal, and being the Lead System Engineer would be ideal because I would be familiar with spacecraft design and I’d know all the details of what I was writing about. Since I’d also get to work with some great engineers and scientists, and they asked so nicely, I said yes. 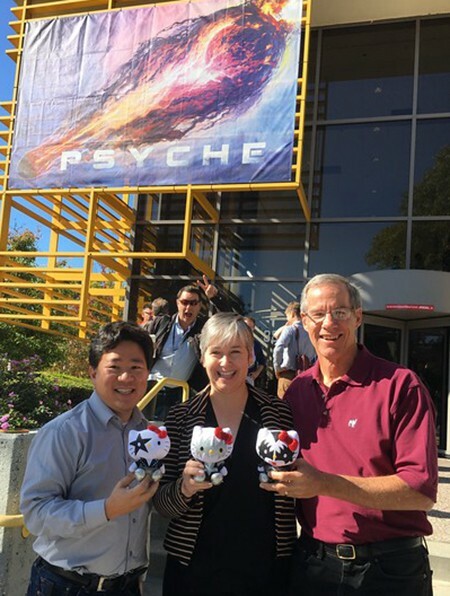 Proposal leader David Oh, Principal Investigator Lindy Elkins-Tanton and me holding the Psyche mascots (metal kitties because Psyche is all metal) during one of the proposal reviews. The NASA Discovery Program that we submitted the Psyche proposal to funds science missions that cost about $450M, and NASA competes the mission in a two-step proposal process. As the Lead System Engineer for the Psyche flight system, I worked very closely on the spacecraft design with David Oh, who was the proposal leader (called the Capture Lead at JPL) for the Step 1 Proposal and then had two jobs, the proposal leader and Project System Engineer, on the Step-2 proposal. He did an amazing job. The decision was made to partner with SSL, one of the leading manufactures of communications satellites in the world, to build the majority of the spacecraft for us. SSL had never partnered with NASA to build a spacecraft for deep space, so this was a gamble. The lure of a world class spacecraft manufacturer who already had the power and electric propulsion system we needed on their spacecraft was too attractive for us to pass up. I worked very closely with Peter Lord of SSL and the rest of the SSL team converting their Earth-orbiting spacecraft design for use in deep space. I’ll be talking more about that work in my next blog. The SSL engineers kept telling me through this phase that Psyche was the smallest size spacecraft they’ve built in over 20 years, but their spacecraft production-line was impressive and unfamiliar to NASA where we build largely custom spacecraft for each mission. In the end, I wrote a lot of the two proposals, with major contributions from members of the proposal team and the JPL Program Office, and we won! It sounds so easy when I write it like that, but it was a demanding and exhausting experience. Psyche Proposal team in front of a conceptual-model of Psyche on display at SSL. I’m in the back with the other tall people! Once you win, the real engineering work starts of actually building the spacecraft and flying the mission. It’s a big deal and costs $450M for a reason…it has to work. A lot of engineers from JPL and SSL are involved in the process. Many are subsystem engineers who work on separate parts of the spacecraft and their components. Others are systems engineers who are tasked with making all the parts (the different subsystems) work together, and also assembling, testing and launching the spacecraft. In my case, having led much of the initial design of the spacecraft and writing the proposals, I was very familiar with the overall design and knew where all the bodies were buried. I thought a good role for me would be a Chief Engineer position where I could jump on problem areas and fix issues that might emerge in the spacecraft design and implementation from my unique perspective. After careful consideration, the Psyche leadership team decided that I was qualified to be the Spacecraft Chief Engineer. After working with me for the past few years on the proposals they also probably thought I was nice enough to not cause any major problems. However, I’m planning on being very difficult or demanding when I need to be to make sure that Psyche is a success! More on the Psyche spacecraft and electric propulsion coming in my next blog!